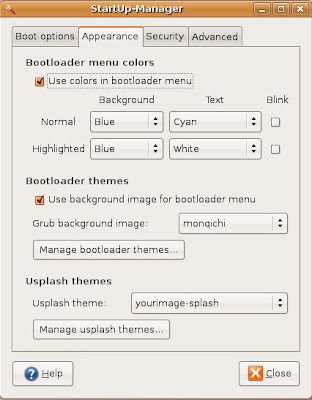 Change: Grub timeout, default boot title, number of kernels in bootloader menu, enable/disable boot option for memtest86, enable/disable boot option for "rescue mode", if the default boot option should be automatically updated, bootup resolution and color depth, grub menu colors and background, and usplash theme. Change visibility of: Grub menu, colors, background image, usplash and usplash text. so, if u found a hard time in changging your usplash, just try to get .deb package from here then just simply unpackage and install it using "dpkg", orherwise u may choose this nice tutorial "USplashCustomizationHowto" and build it from scratch ..
ini saingan atau versi fork nya dari BUM yah?